My mom makes a mean fruit crumble. She might not know this, but as a child I loved when she made it for us. I could never figure out why hers was so much better than anyone else's, until we made it together during her last visit to Baltimore. Her mantra is simple: double the crumble. No one ever puts enough crumble on top. My father and I are known as the cooks in our family, but this is only because my mother, who is a great cook, prefers to clean our mess and critique our meals rather than get her cute little hands dirty. But when she cooks it's always great and comforting. I guess that is the Irish in her. She'll whip up meat and potatoes, cheesy casseroles, delicious refrigerator cookies, quick shepherd’s pie, and perfect mushroomy beef stroganoff like nobody's business. She'll have you know. During her visit to Baltimore, we were sitting at my kitchen table giggling like fools and drinking wine (as only we can do when we are together) while mom was thumbing through an Amish cookbook in my collection. She came across a recipe for peanut butter apple crumble that made us both salivate like Pavlovian dogs. Of course, it required lots of butter and lots of flour, but the gist of the crumble was decadent natural peanut butter to help form the gooey crumbly texture. And what goes better with apples than peanut butter? It was the perfect recipe to recreate with gluten free and dairy free ingredients. It took a few tries (for example, mom put cumin instead of cinnamon in the first batch...she blames the wine) but we finally got it right. It was an absolutely noteworthy apple crumble for a noteworthy cook and mom. Of course, we doubled the crumble. Heat oven to 350 degrees. Grease a 9-inch square baking pan. Stir together sliced apples, ¾ cup sugar, and ¼ cup brown rice flour in large bowl. Spread in prepared pan; dot with 2 tablespoons margarine. Combine oats, remaining ¾ cup brown rice flour, ¼ cup tapioca flour, remaining ¼ cup sugar and cinnamon in medium bowl; set aside. Place 1 tablespoon of margarine and peanut butter in small microwave-safe bowl. Microwave for 30 seconds, or until the mixture is melted; stir until smooth. Add to oat mixture; mix gently until crumbs are formed. Sprinkle crumb mixture over apples. Dot with 2 tablespoons of margarine. Bake uncovered for 40-45 minutes or until apples are tender and edges are bubbly. Cool slightly. Serve warm or cool with whipped cream or ice cream, if desired (I don’t do this because I can’t eat dairy, but this is how my husband and family rolls). 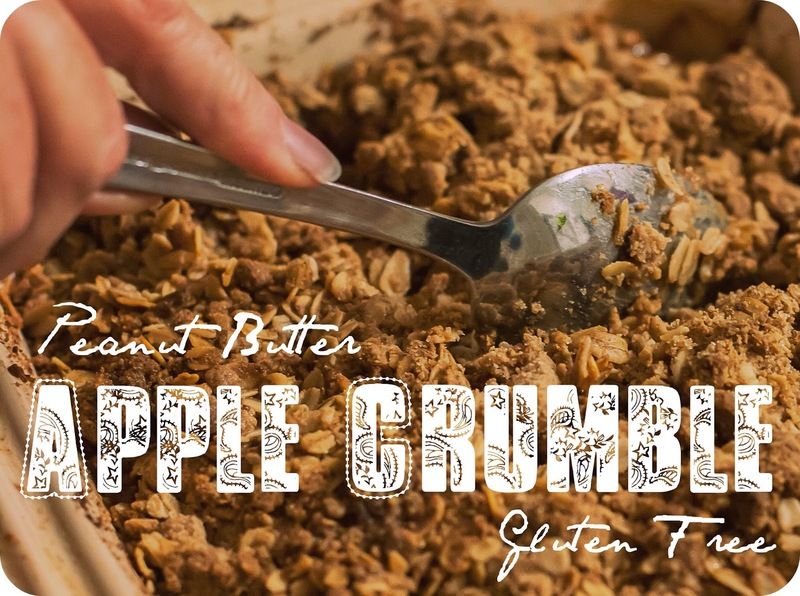 I love fruit crumbles, and the idea of adding peanut butter is ingenious! Sounds soooo good. I love apple in any dessert so I am sure I will love this! Lol. No I didn't have the stupid code thing before. I hate them too. I am just getting like 200 spammers a day lately and thus helps. Damn spammers. Hi daughter dear! That recipe was all you, but did you have to mention the cumin? It *was*, of course, the wine but good thing I noticed it before we baked it! I love you two for doing most of the cooking and not minding when I critique - which is usually to say how lovely everything is except it needs more salt, or less salt, or wouldn't it be better, if...? Thanks for the wonderful dessert blog! That sounds just like a crumble they sell in the Amish market here. Cumin, though ... hm ... you must have your spices alphabetized, like I do.